EDP, one of the UK’s leading health, safety and environment consultancies, has completed the strategic acquisition of IOM Consulting Ltd’s (IOM) asbestos site services division. The acquisition is part of EDP’s growth strategy following a management buyout in 2014, and enables EDP to provide clients with a full range of property compliance and risk management services that now includes UKAS accredited asbestos surveys, re-inspections, air monitoring, and 4-stage clearance; as well as remediation consultancy and asbestos awareness training. As part of the acquisition, a 34-strong team of experienced asbestos staff from IOM have joined EDP. In addition, EDP has acquired the office locations in Glasgow and London, with specialist teams also located in Edinburgh and Stafford, which will significantly increase EDP’s geographical spread across the UK. Rob Aitken, CEO of IOM, comments: “This decision has been carefully considered as the asbestos site services division has been a long-standing and fundamental part of IOM since 1990. During this time the division has made a vital contribution to our business whilst building a reputation for excellence, quality and service. However, the marketplace has changed significantly and we believe now is the right time to hand over these services to EDP who share the same values of excellence, quality and service. " EDP provides health and safety, property compliance, environment, sustainability and security consultancy services to large PLCs and smaller corporate businesses regionally, nationally and globally. For further information please call EDP on 08456 44 53 54. 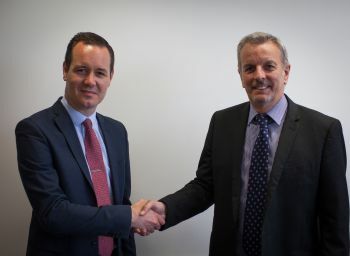 Pictured: Mark Haydock, Managing Director, EDP (left) and Rob Aitken, CEO, IOM Consulting Ltd (right).